A roller coaster derailed at the Daytona Beach Boardwalk in Florida on Thursday night horrifically leading two people falling from the car and multiple other people getting hurt. 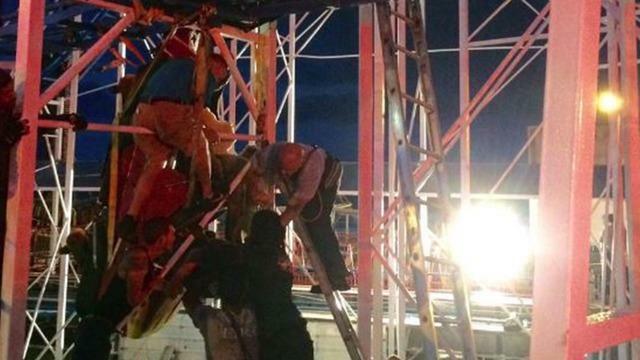 Daytona Beach Fire Department confirmed that two people fell from the ride’s car, which was left dangling upside down roughly 35 feet off the ground. Firefighters also worked to rescue others left stranded on the roller coaster. One man was seen walking down the ladder of a fire truck with the assistance of two firefighters. The extent of the injuries of the two who fell is not known yet. Six of the ten people rescued from the ride were taken to the hospital for treatment. It’s not yet determined what caused the ride to come off the tracks and derail. An investigation is ongoing.